In my first Wool on Sundays post, when I said “I’ve decided to start WOOL ON SUNDAYS. From Monday to Saturday each week Rainbow Hare will carry on unchanged with my usual mix of sewing quilting and random and I’ll save anything related to wool or yarn for Sundays”, I didn’t expect that a year and a half would pass by with barely a sewing post. And in January, I really meant to be linking up with every Scraptastic Tuesday this year. 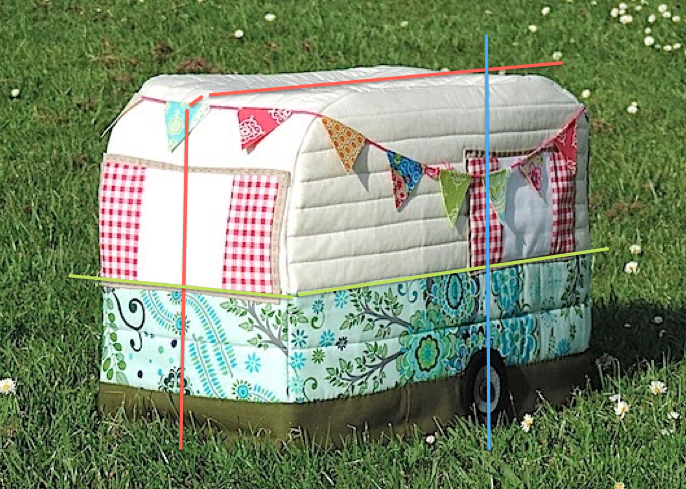 Today, I am again attempting to get back to sewing! And I’ve made a start on a cushion, which is going to be a Wedding gift for someone who likes mice. The mice are copied from the Clothworks Chocoholics range and will be appliqued. If I’d had more notice for this, I would have ordered some of the actual fabric but, in a few days, this (in-progress) cushion must fly away to Poland. Perhaps the mouse lovers would like a Christmas or birthday cushion…Meanwhile I hope this will be a Scraptastic Tuesday finish by next week. I’m also set to go with the Merchant & Mills (paper) Dress Shirt pattern, although I’m worried it may end up looking like a tent…It’s nothing like anything I’d usually choose but, for some reason, I love this pattern. As a worse case scenario, I suppose, I will be able to alter it and have a navy linen skirt but I’m hoping the dress will turn out to be nice. And I even have a sewing finish, although the crochet rather overpowers the sewing. Hopefully, by next week I’ll have made some more progress! I'm looking forward to seeing what you do with the vintage linen! 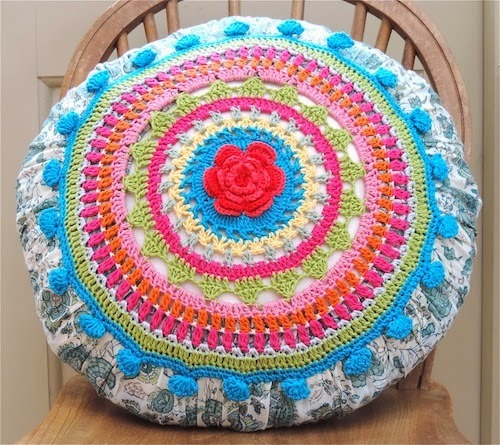 What a super use of upcycled vintage embroideries, it looks gorgeous! Pretty embroidery, cute mice and nice dress pattern too! The mice are just gorgeous! And those tablecloth embroideries are divine – can't wait to see what they become. The mouses are so sweet! 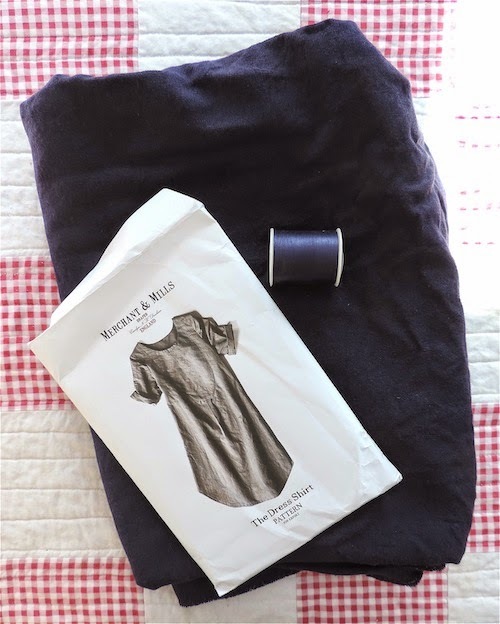 I have an occasional urge to sew clothes but I lay down in a darkened room until the urge goes – dressmaking means following instructions!!! 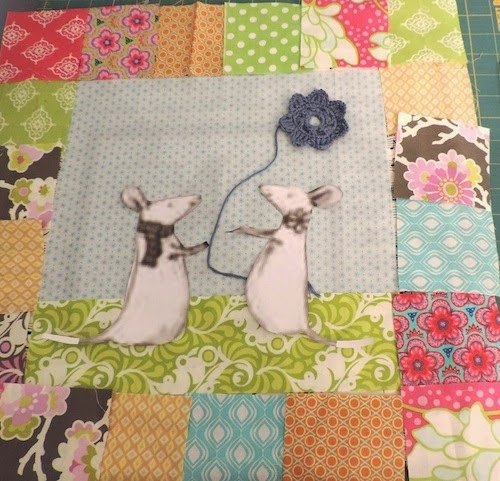 Love those sweet little mice and the fabrics are lovely. This is going to be a gorgeous cushion. Oooooh….all those embroidered pretties. I am certain you will come up with a lovely make! Your dress/shirt pattern is cool…..very “on trend” as they say! Those mice are absolutely adorable Janine, I am sure they will be loved by the recipient whenever they arrive! 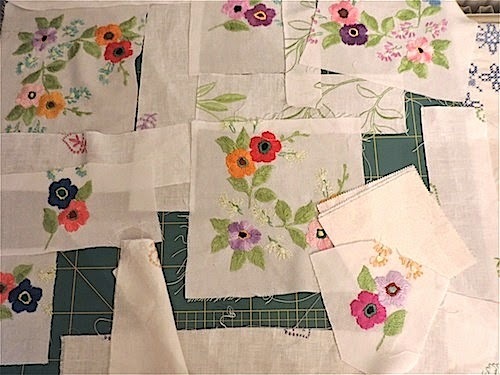 Vintage tablecloth envy – I know you are going to make them into something lovely and look forward to seeing. The recipients of the mice are going to be very happy! I do like a nice variety of projects and these are great. How are you planning to appliqué the cute mice? I remember my Mum starting an embroidered tablecloth- all that work! By repurposing the embroideries they will be appreciated all over again. I almost felt it was sacrilegious when I made an angel outfit for my granddaughter out of a damaged Victorian cutwork linen sheet but at least it was being used again. 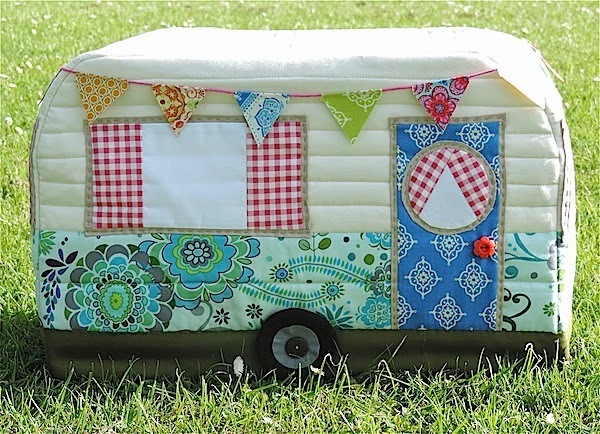 Keep up the good (sewing) work! That mouse pillow is going to be the perfect gift. It is very cute. The pillow and the vintage linen are scraptastic!!! Can't wait to see your new frock!